As a track chair of the conference you can manage submissions related to and submitted for your track. Your submission list will populate automatically with a new submissions as someone submits for your track. There are couple of things you can do with submissions and their authors and this article will explain the process. 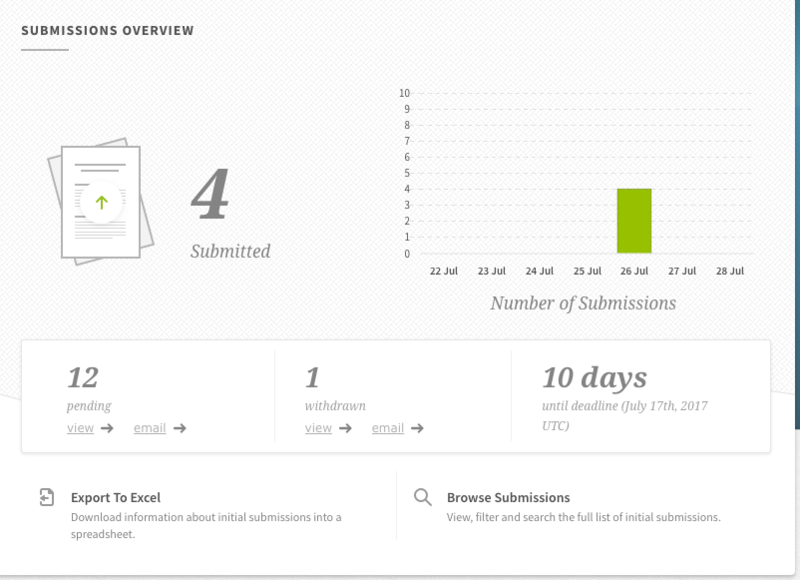 If the submissions are still open, you will see your submission overview card on the dashboard as below. Number of successfully submitted abstracts/papers on your track and a graph showing the submissions entered over the last week. Number of pending and withdrawn submissions - If you follow the link from a card it will take you into the filtered list of those submissions. At the bottom of the card you can export your submissions into an Excel spreadsheet. 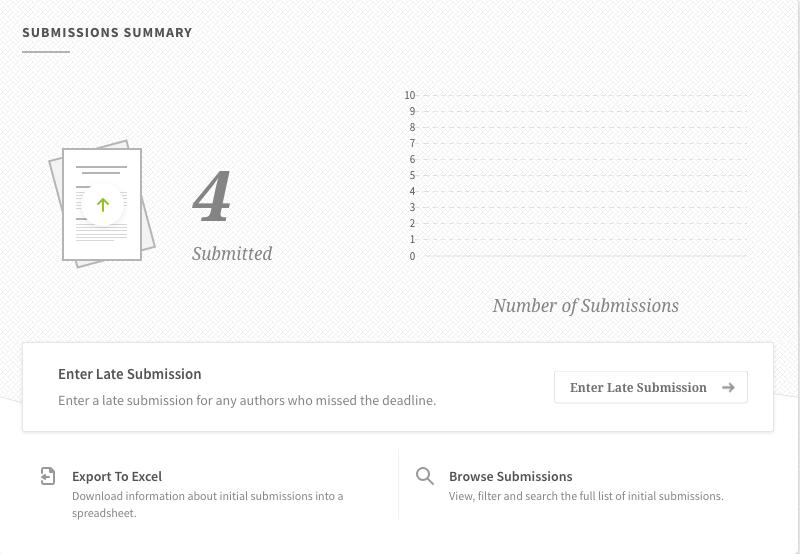 You can also view the full list of submission by selecting Browse Submissions. In your submission list, you can filter by submission status, submission format and topic, or you can search by ID, author name or by submission title. You can also add new submission into the system by selecting the green New Submission button in the corner . To see more options on each submission click on a submission title to expand the view. At the bottom right corner you will see couple of options - Edit, Withdraw, Delete and Contact Authors on that submission. Browse the full list of submissions. The options available in the submission list are always the same, so you can still use the filters and search box as explained above. As a track chair you can contact all authors who submitted for your track. To contact any group of authors you can use the Communication hub. You can read more about steps here.